Once again, the October beginning of coffeeneuring season found me on the road. I always treasure the opportunity to work two-wheeled beverage hunting into my travels, but this year I really outdid myself. During October I was in both China and Japan. The Facebook posts may have US dates and times – but this blog records the local date of my adventures in all cases. Ride 1: October 7, 2016 – Beijing gave me a 12-hour time advantage over the East Coast US to begin coffeeneuring…making me perhaps the first official 2016 rider. 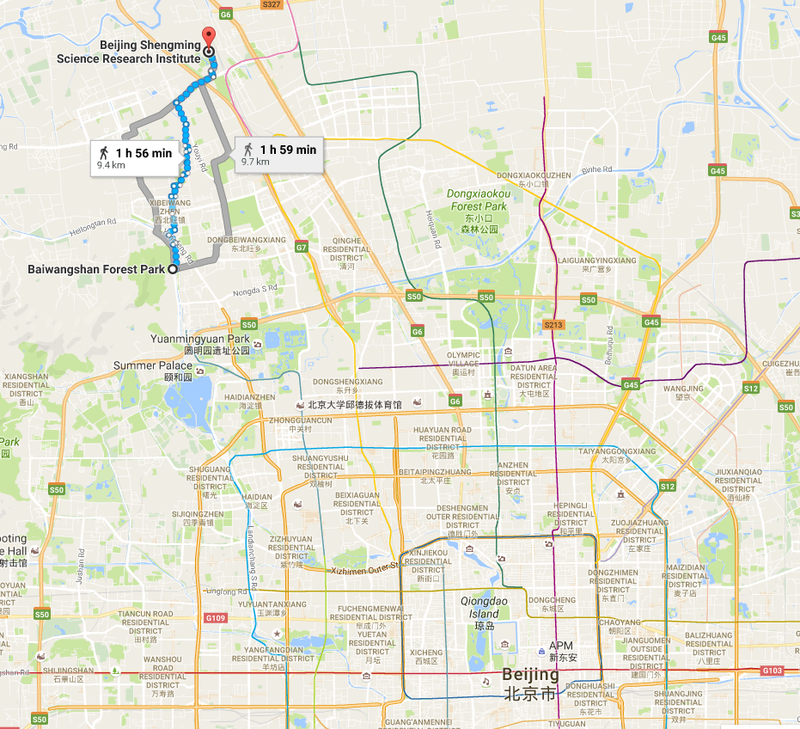 It was a rainy morning, so I procrastinated a bit, but then took my newly borrowed bike in a loop between the Cycling Yogi’s office and the nearest metro stop (Life Sciences Park – in the upper northwest corner of Beijing) to ensure the requisite 2-mile trip. Between the modern office buildings, apartments, shopping malls, and metro station there is an area that looks very different. Tiny crowded shops, produce vendors, purveyors of street food, and lots of dirt, litter, and garbage make for an old world atmosphere. Despite the garbage and smells, I prefer this glimpse of old-style China over the shopping mall, which could be in any American city. I loved riding this adorable one-speed bike: look at the pedals!!! 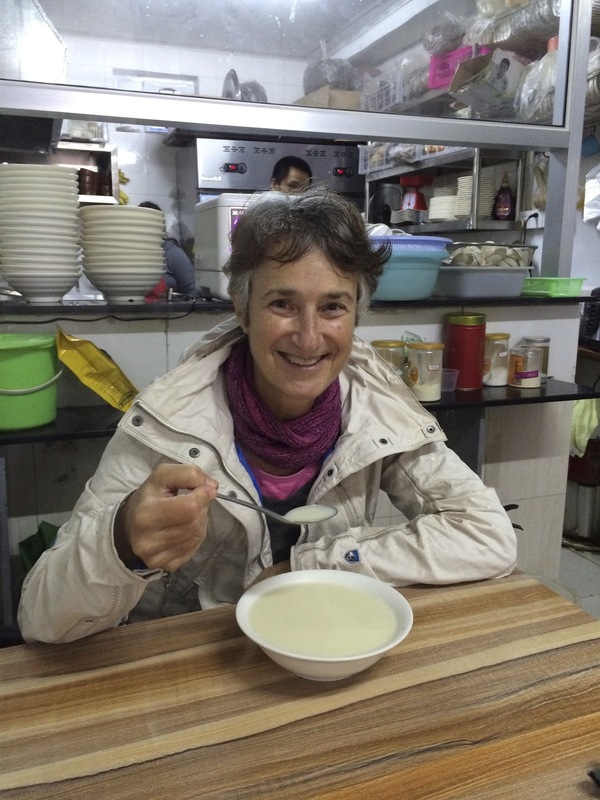 The Cycling Yogi met me on foot and helped me negotiate our order of doujiang – warm soymilk, which I had been looking forward to sampling. 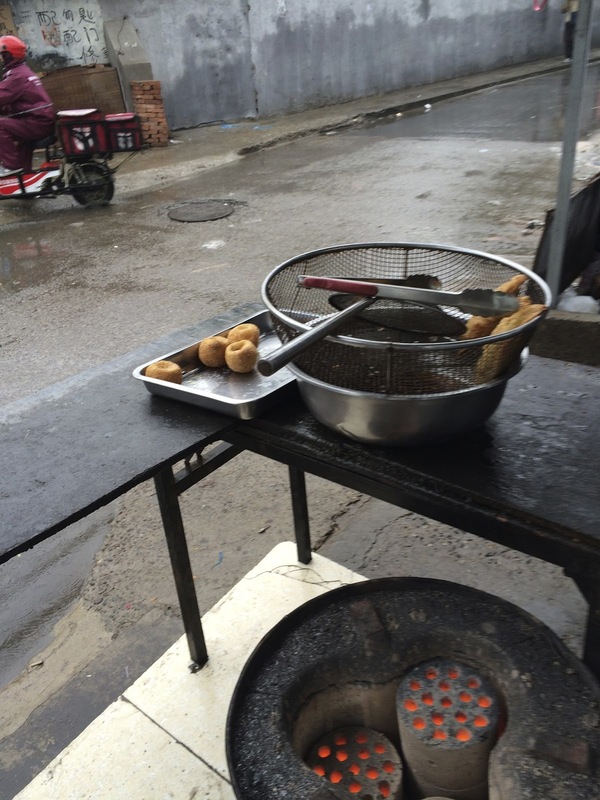 Traditionally it is served for breakfast with a long twisted doughnut-like pastry crumbled into it. We were too late for these, but did manage to get some delicious sesame balls to accompany our large bowls of doujiang…the whole breakfast for both of us costing under a dollar. While he walked back the short way (down a narrow dirt alley and across two sets of RR tracks), I biked the longer way, having to share bike lanes with electric motor scooters and dodge cars, which never yield the right-of-way to bikes or pedestrians. Ride 2: October 8, 2016 – I wanted to get a longer bike ride in Beijing, although long rides proved to be not very pleasant. The Cycling Yogi had not managed to find a large enough bike for his Beijing use – given that he’s 6 feet tall with a long torso. 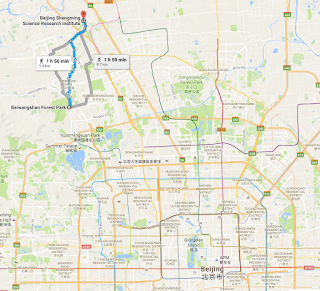 A friend had located the right neighborhood for him to find a good bike store – near Peking University – so we hatched a plan. 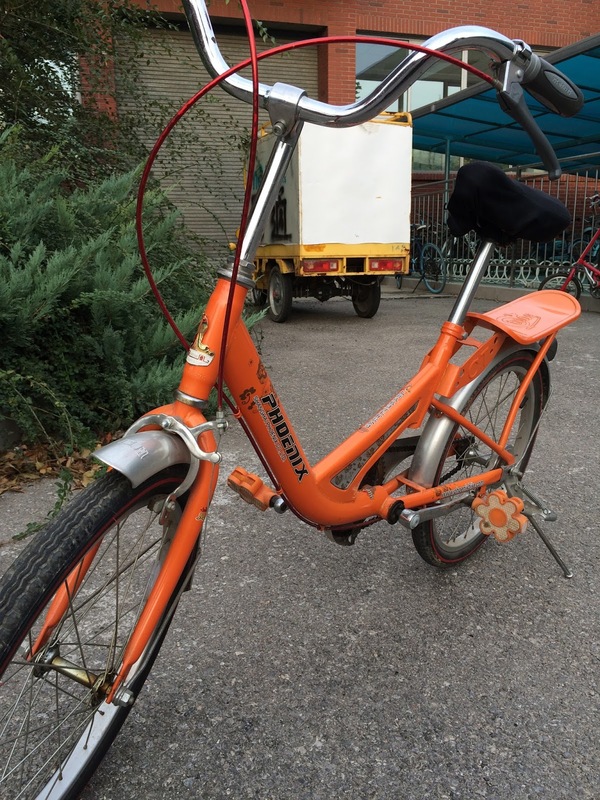 He rode my little orange bike – standing all the way there – and I took the subway. He easily found a nice bike at a good price and we stopped for tea and food. We then headed to Bai Wang Shan Forest Park – a non-touristy park located on probably the only mountain in Beijing. As luck would have it, this was the one day of clear blue skies for my entire three weeks in China. We parked our bikes and hiked to the top, getting magnificent city views. The view was amazing - we were lucky to have clear blue skies: rare in Beijing! Our ride back entailed many navigational snafus. Cycling directions are not readily available; bike “lanes” that run along a major highway often turn into smaller access roads – always used by motor scooters and often used as convenient parking spots for cars – and side roads peter out with wild fields and footpaths creating interesting (and frustrating) routes. Total distance – I’m not sure, probably around 10-12 miles. Fortunately I’d had the opportunity to bike a lot in the countryside the previous week in the beautiful area of Yangshuo, along the Yulong River. This was a far more pleasant biking experience than I had in Beijing. 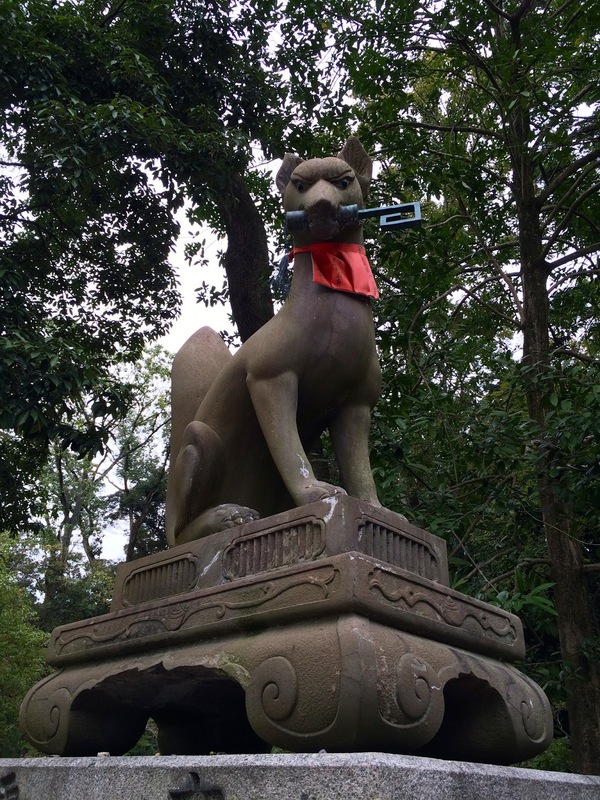 Ride 3: October 22, 2016 – After leaving Beijing I spent two weeks in Japan, hiking through beautiful countryside, exploring small villages, and visiting the large cities of Tokyo and Kyoto. I had little opportunity for cycling, but was able to get a bike from my Kyoto hotel toward the end. 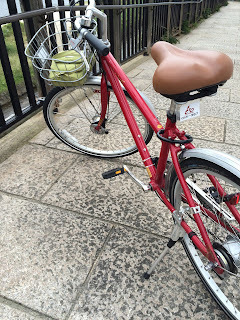 It was a supremely comfortable 7-speed internal hub bike ($13 for the whole day!) and I made my destination the Fushimi Inari Taisha shrine (fox shrine) – famous for its thousands of red torii gates and strenuous uphill hike. Kyoto has a long canal running north-south which has broad multi-use paths on both sides. For some reason, however, my navigation system insisted I get off the lovely canal path and took me through many city streets, including bridges over highways that left me feeling the path couldn’t possibly be right. 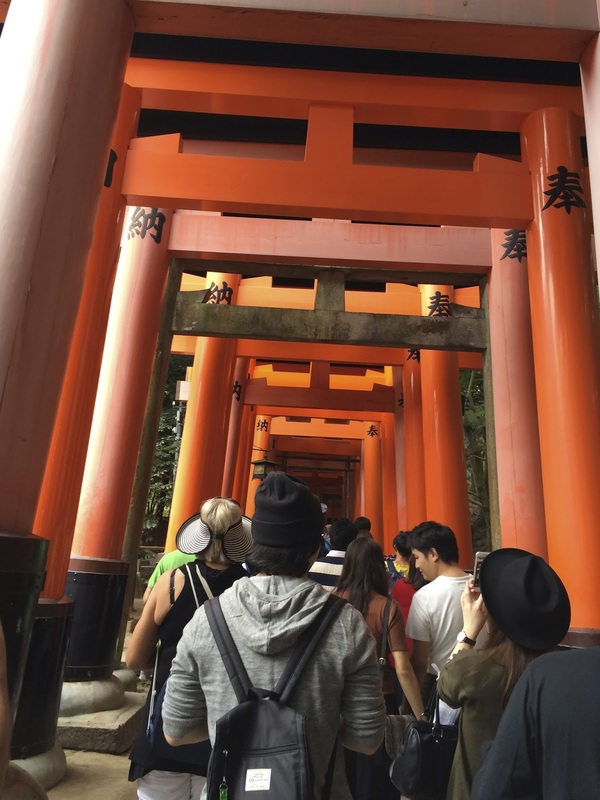 But I prevailed and soon found myself in the Saturday hustle-and-bustle of busy train stops, street vendors, and foot traffic leading up to the grounds of the shrine. Foxes are revered, in part, because they eat mice. 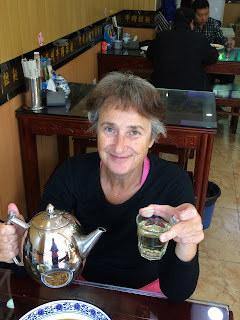 I had taken my own tea in a bottle, but I stopped to sample a sweet concoction of sticky rice ball that was stuffed with a choice of sweet bean, green tea or, I think, chestnut. I thought the green tea was most in keeping with the coffeeneuring spirit, so that was my choice. As I was navigating on foot, I noticed that the canal came very close to where I was, so I decided to ignore the phone navigation and follow the canal back. It worked just fine – although several times I had to cross from one side to the other and I discovered that this part of the canal was not the major canal; it was a few miles before I hooked up with the “official” canal. The canal paths made for perfect cycling. I wish I’d had more time for biking in Kyoto. Although there is plenty of traffic, drivers are very considerate and there is much good infrastructure. 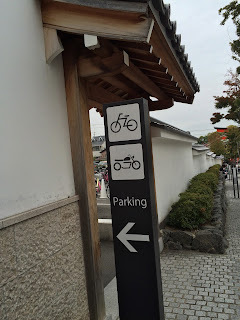 I was concerned it would be confusing to get used to riding on the left, as is the rule in Japan. However, this was my informal observation – and I’m not sure whether it’s accurate or not. When bikes and cars shared the road it seemed to be the convention for bikes to ride opposite the oncoming traffic. This meant I got to ride on the right, as I was accustomed to do. Total mileage – about 8 miles. Ride 4: October 25, 2016 – Two words: jet lag. When I returned from Japan I was exhausted but found myself unable to sleep at night. My body’s internal clock was all confused. After five weeks of travel, where I rarely had access to the kind of strong French Roast coffee I normally brew at home, I was really looking forward to a gigantic mug of my own home brew. I had plenty of coffee at home, but no cream, and I wanted the whole perfect cup. 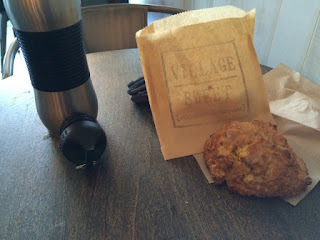 So I took my coffee in a travel mug to Village Sweet in Westover, added their yummy cream, and bought a pumpkin scone. It was divine! (Note on bike friendliness: there is no place to park right in front of Village Sweet, but plenty of good bike parking across the street in Westover, and their baked goods are worth the minor inconvenience.) From there I went to the gym to lift weights and take a steam – two other things I’d been without for 5 weeks - and then picked up the last installment of my summer CSA, so I’d have some fresh veggies. I was in quite a fog. Total mileage – about 6 miles. 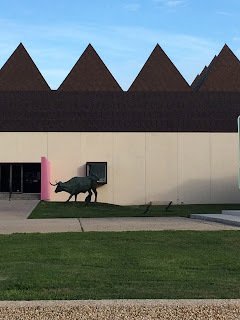 Ride 5: October 31, 2016 – Well, everybody seemed to be hopping on the early voting bandwagon so I decided I would, too. 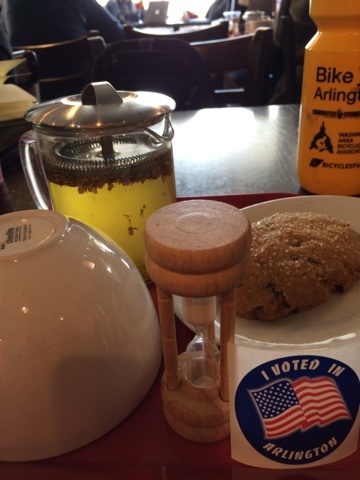 I rode to the Arlington Courthouse, cast my ballot and then stopped at Northside Social where I had a ginger-turmeric tea and pistachio chocolate chip cookie: both delicious. (Bike friendliness note: NS has 3 bike "staples" but they are usually full. Perhaps a few more are in order as the place is - with good reason - very popular.) From there I made a stop at the library and headed home for a total of about 8 miles. The leaves were beautiful, the air crisp, and I felt lucky to have such great bike riding weather. Ginger-turmeric tea seems to be the latest craze. Ride 6: November 7, 2016 - With the change to standard time it now gets dark very early. Bike Arlington sponsors a free light giveaway and I volunteered to help by the bike counter in Rosslyn. 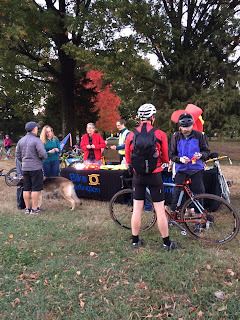 It was great fun to give away lights and encourage people to pick up other reflective gear to help them stay visible in the dark. Once the sun went down, however, I got quite chilled, even with my jumping around to attract cyclists. So I left for home, decked out with a few supplemental blinky lights and a new Bike Arlington reflective vest. I decided to stop at The Italian Store, close to home, thinking I could get a decaf cappuccino. No luck - their coffee bar had closed up for the night. But I needed something hot, even after fast-pedaling 4 miles up hills. So I got a slice of pizza and a limonata. Total distance - 10 miles. I wanted hot coffee, but had to settle for hot pizza and cold drink. 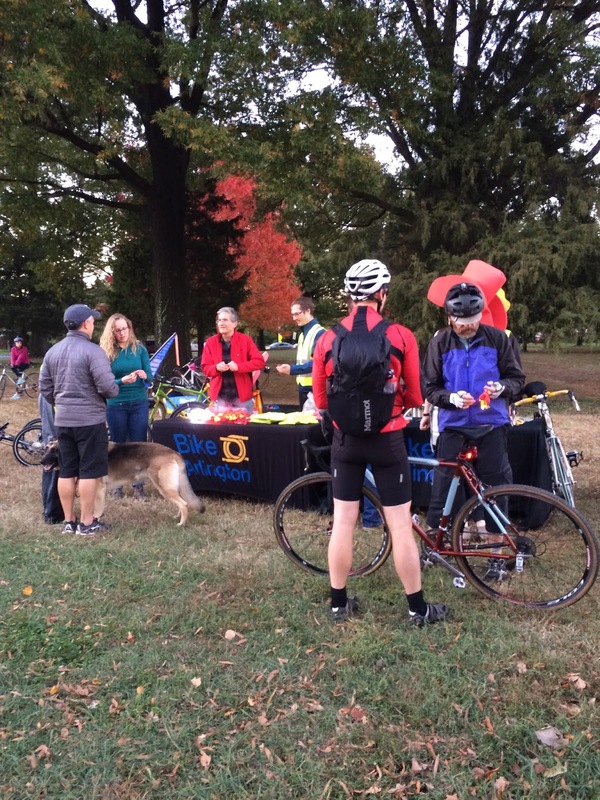 Ride 7: November 11, 2016 - Is any coffeeneuring season complete without taking at least one ride on a bike share? 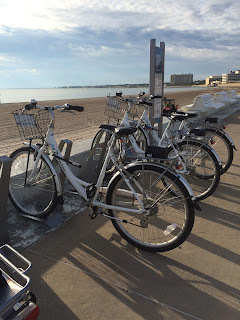 Not for me and I love the challenge of seeking our bike share systems wherever I travel. 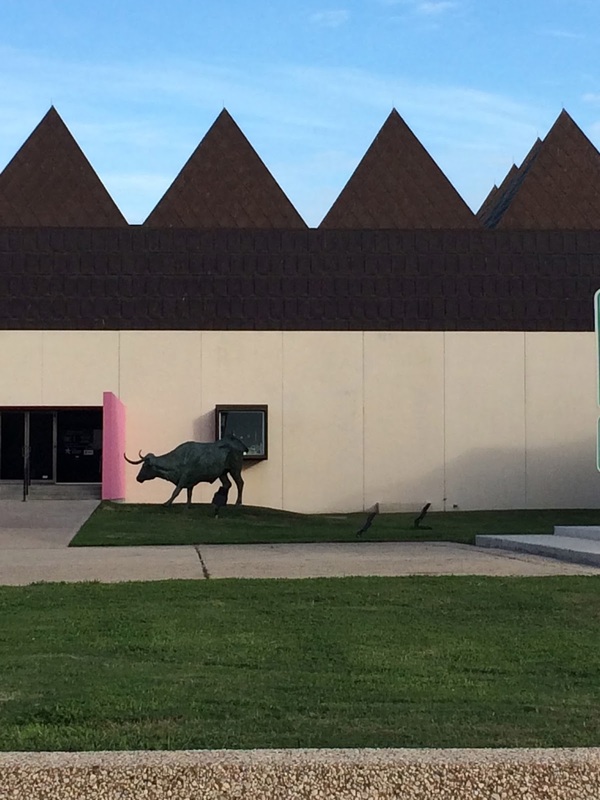 But who'd a thunk I'd find one in Corpus Christi, Texas? Okay - here's a little self-promotion. An essay I wrote was awarded first place in creative nonfiction by the Coastal Bend Wellness Foundation - a very worthy organization that provides free health services and promotes women's health. Published in the literary journal of Texas A&M University - The Switchgrass Review - I was invited to read from my work at their fall festival. I think the total system has 40 bikes and fewer than 10 docks. The next morning I checked out the city's new bike share system - in operation since August. I had planned ahead and downloaded the Zagster app, which you need to secure a bike. 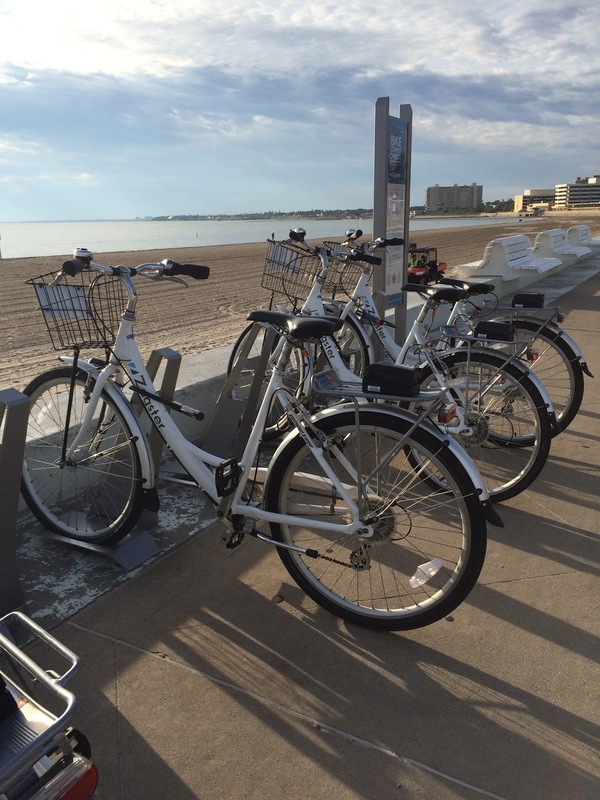 Unlike other bike share systems, these bikes are secured to their dock with a U lock. The key is in a locked box on the back of the bike. When I could not unlock the first bike, I called customer support which was quick to respond - even at 8 a.m. on Veteran's Day! They cancelled my ride and I was able to unlock the next bike. 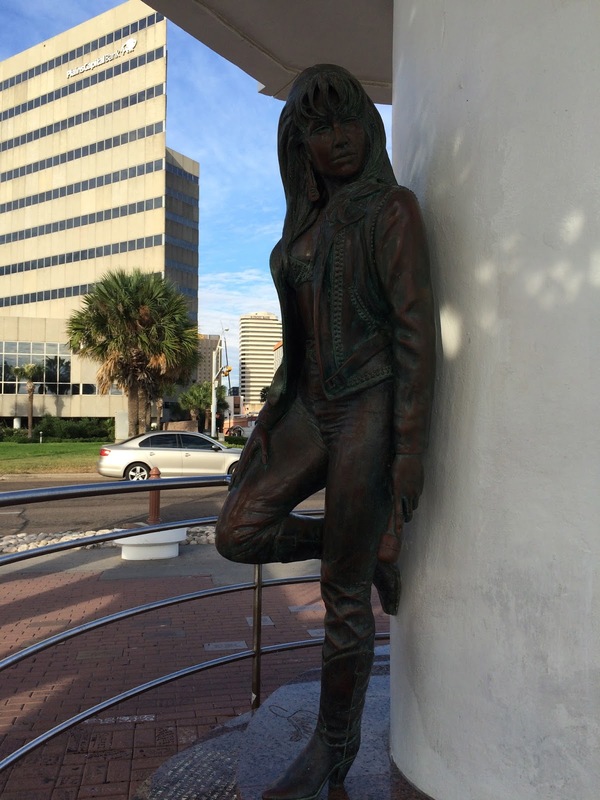 The docking station was just steps from my hotel, and right on the Gulf of Mexico. 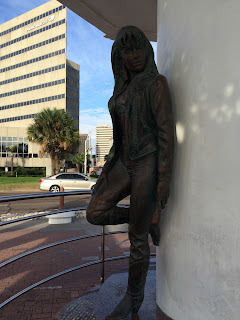 I rode as far as I could go up the shoreline, which had a nice multi use path, past the statue of the Tejano star Selena, a Corpus Christi native who was tragically murdered at the age of 23. Going north I came to the arts and entertainment area, with many museums and so forth. A large construction area made it challenging to get from the shoreline and ride more inland. I had searched for coffee shops, but then made many wrong turns and did not manage to find one that looked appealing. Ideally, I would have found a place serving a Tex-Mex breakfast. But it was not to be. The advantage of a bike share that comes with a U lock is I could have locked the bike anywhere - even when I couldn't find another docking station. And the rental system doesn't require bikes be returned within half an hour. Plus - the system is CHEAP! As you can see from my receipt, I kept the bike nearly an hour and a half for the low price of $3! But, back to food - the restaurants that appealed to me didn't open until 11 (too late for me to get to the airport and make my flight home) and I refused to go to a place called Whataburger. 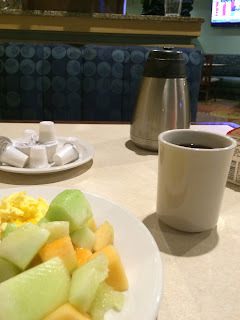 So I cycled back to the hotel and chowed down on their brunch buffet - complete with coffee. By the time I had brunch, I think anything would have tasted good! With all my twists and turns, I estimate I rode about 8 miles. Then I got to walk on the beach, put my feet in the warm gulf and fly home.